SITAONAIR’s trademark ‘open platforms’ approach is turning the aircraft Internet of Things (IoT) concept into a reality, in a key development for the air transport industry. By applying its open platforms approach to delivering bespoke IoT capabilities onboard, SITAONAIR will securely integrate diverse aircraft avionics – encompassing sensors, connectivity, hardware, applications and more – heightening the potential of the connected aircraft. For this aircraft IoT project, SITAONAIR is joining forces with two pioneering cargo carriers AirBridgeCargo Airlines (ABC) and CargoLogicAir (CLA) at the 2018 Farnborough Air Show in July. They will demonstrate how SITAONAIR’s IoT platform enables two strategic partners, ABC and CLA, to monitor, in real-time, the journey of sensitive pharmaceutical cargo inflight. 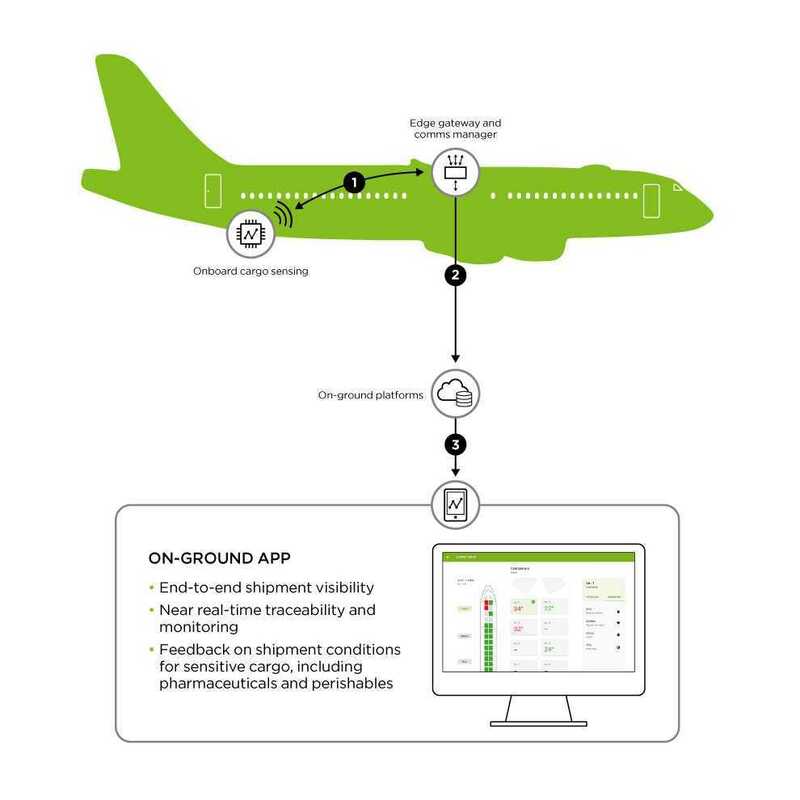 collecting IoT data provided by OnAsset Intelligence, its demo partner and cargo-monitoring specialist, during the course of a flight. This OnAsset Intelligence data is then fed through SITAONAIR’s onboard IoT edge gateway. The data can then be sent, securely, to its ground data management and dispatch platform, built to monitor the inflight status of carriers’ goods. Currently, there are no other solutions on the market that provide inflight cargo sensing and freight condition visibility, as perishable and temperature-sensitive goods can only be monitored on the ground. SITAONAIR’s collaboration with AirBridgeCargo and CargoLogicAir therefore represents a shift in technological intelligence, enabling actions or decisions to be made inflight to help optimize performance. David Kerr, CEO of CargoLogicAir, highlights: “Customers in the air cargo industry are aiming at getting a better digital experience. With SITAONAIR we will be able to move towards the establishment of a holistic digital environment for our customers”. Dominique El Bez, SITAONAIR VP of Product & Strategy, says: “We are proud to work with AirBridgeCargo and CargoLogicAir to further improve inflight aircraft and transported assets monitoring, bringing additional value to the airline. “With over two-thirds (67%) of commercial airlines surveyed by the SITA Group aiming to invest in Internet of Things initiatives in the years ahead, the IoT arena is truly set to take off. As the true experts in delivering the promises of the connected aircraft, through our wealth of inflight connectivity, aircraft data management and aircraft communications solutions, we are naturally positioned to bring game-changing innovation to the aircraft Internet of Things space.